Thank you for attending today's auction. We accept Cash, Good Check, and Credit Card. There is a 4% convenience fee for using a credit card onsite. We also accept wire transfers for an aditional $10 processing fee. ALL BUYERS OUT OF THE US BUYING CARS - WIRE TRANSFER ONLY. There is 5.5% sales tax. 10% buyer's fee in house. (15% buyer's fee online NO CREDIT FEE FOR ONLINE. )IN HOUSE BUYERS: PAYMENT IS REQUIRED DAY OF AUCTION! IF BUYING A VEHICLE: A minimum of 10% down payment is required day of auction - NO EXCEPTIONS!ONLINE BUYERS: Any purchases over $5,000 will require a wire transfer (add $10 bank processing fee). This wire transfer must be done within 48 hours. If no transfer is made within that time, your registered credit card will be charged 10% of the remaining invoice balance until it is paid in full.Any checks returned or credit cards charged back will be subject to all fees for collection and banking. All disputes will be settled in Waushara County Court in Wautoma, WI. All items sold as is no Warranty!FOR MEMORABILIA***If you see a lot marked as "age unknown," that means we do not know how old it is, but in our opinion it may not be old. *** "Authentic/Original" means we believe it to be all original. Everything marked "authentic/original" will be guaranteed. *** "Not Old" means our opinion is the item is not very old*** "Fantasy Art / Yard Art / Garage Art" means an original was never made .If you are the successful bidder on an item and you fail to pay for it, you will still owe 20% to W Yoder Auction, LLC for commission fees. You are authorizing W Yoder Auction, LLC to charge your credit card a minimum of 20% of the gross of your item(s).Bid increments are for prebidding only. Once the auction goes live, increments are subject to change at the auctioneer's discretion at any time. This is a LIVE auction. The Auctioneeer shall designate the Buyer after each item is auctioned and the auctioneer's designation of a Buyer shall be final NO EXCEPTIONS.Example of how online vs live bidding works::: Your max bid is $100 (assuming bid increments is at $5). At first there is a bid online at 90 (and now you put in the max at $100), which then moves you to 95, and then we went to the live auction, and a floor bidder then bid 100, putting him in the lead. We cannot see that your max bid was 100 at this time, and the computer automatically bids for you, putting your bid at 95 NOT 100. we are as if the online is here sitting in the crowd and it is like a back and forth bidding between 2 or more bidders, both online and in house. Again, I want to remind you, this is not our rules, it is how every online bidding system works, and we've used them all, and see the same results when both online and in house are going simultaneously.SHIPPING NOTICE: We use FedEx and CANNOT send to a PO Box. We will only ship items that can fit into a box! We will NOT ship any other way, even upon your request, unless you have your own account through a shipper. If you have your own account through a shipper, please tell us via email immediately after you recieve your emailed invoice! All shipments will require a signature-no exceptions! 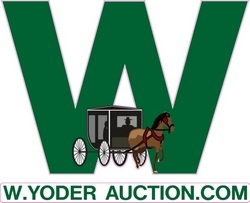 W Yoder Auction, LLC is NOT responsible for lost, stolen, broken, or damaged items. For packaging and shipping, we go by a set amount seen below:SUPPLIES TAXABLE Price to Charge 12x9x6 box 3.00 20x20x6 box 5.00 20x20x12 box 6.00 24x14x14 box 6.00 30x17x16 box 10.00Larger Items on Case by Case Basis**WE USE VARIOUS SIZE BOXES. THIS TABLE IS JUST TO SHOW APPROXIMATES ON OTHER BOXES**LABOR TAXABLE10 minutes or less 6.00 15 minutes or less 8.00 20 minutes or less 10.00 25 minutes or less 12.00 30 minutes or less 14.00 35 minutes or less 16.00 40 minutes or less 18.00 45 minutes or less 20.00 50 minutes or less 22.00 55 minutes or less 24.00 1 hour 26.00 labor includes Shipping and Office StaffFED X CHARGE NON TAXABLEActual Cost - NO Markup*** Any oversized items that FedEx ground cannot ship, will be shipped via Freight! You will be charged for any labor, wood for crating, pallets, straps, (etc) and the freight charge itself! If you are able to set up your own pick up for larger items, we strongly urge you to do so! ****All items will be packaged and shipped within 14 days of cleared payment. you will see a second charge on your credit card used to register for shipping. All Wisconsin Residents have to pay tax, title, & license fees, unless you are a dealer. No Exception. Out of state buyers are required to pay sales tax in their state on titled automobiles.BY REGISTERING ONLINE YOU WILL PERIODICALLY RECEIVE EMAILS OF UPCOMING AUCTIONS.